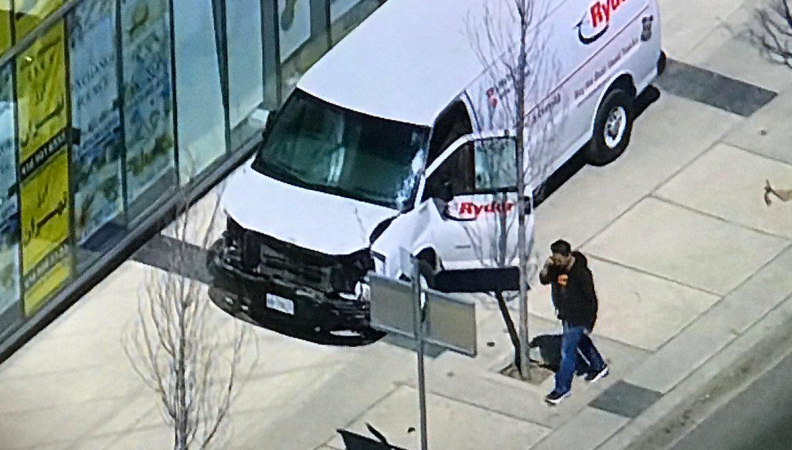 Toronto van attack: genuine or not? Initial photographic evidence of fabrication of part of the event! Please note I am not arguing that people were not killed by a moving truck. Rather that elements of the media account appear to be inconsistent. This is principally based upon the direction of the shadows cast that differ significantly. Repeated familiar and coincidental features of high-profile terror events, are evident but not discussed here. 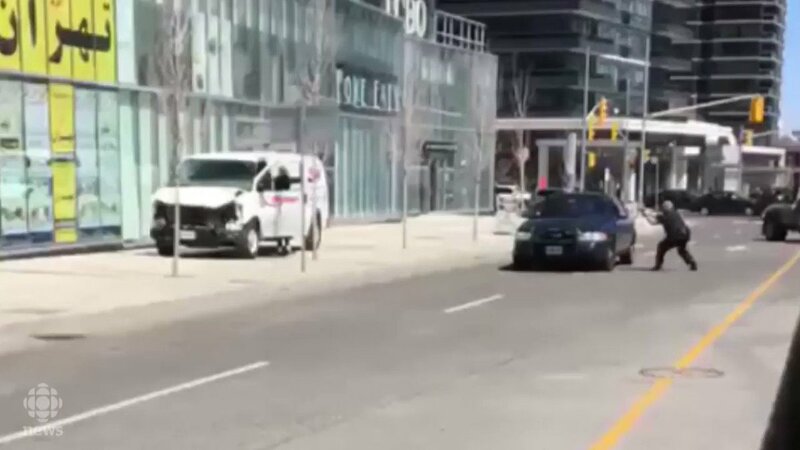 The attack occurred on the same day as the G7 foreign dignitaries meeting in Downtown Toronto. Shades of 7/7? The following come from "Vince" who appears as "vce7". This identifier also appears on the second part of Video A. Clearly at a later time than the first part of Video A! 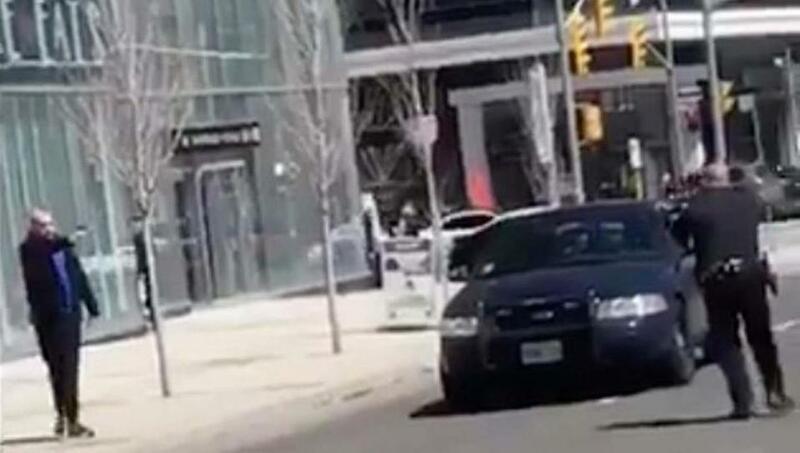 In the first part of Video A showing the initial stand off, the sun shadows in this West/East street are clearly perpendicular to the direction of the street. However in both the second part of Video A and in Video 3 that purport to show the same incident, the shadows are distinctly different. They now point in a North Easterly direction. This cannot be explained by just camera angle because Video 3 is also taken at ground level, in much the same position as the first part of Video A, although from a different vehicle that has a black rather than a white off-side (left) wing mirror. 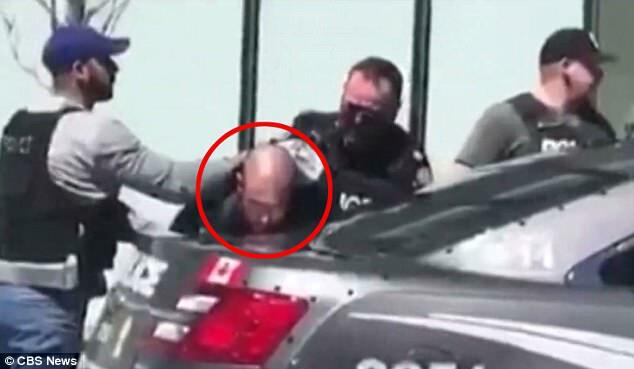 The only reasonable conclusion that can be drawn from this is that the first part of Video A, widely circulated by the media channels (see also the still images below) was in fact taken at a slightly earlier time than the sequence taken from above at the end of Video A and replicated in the arrest sequence in Video 3 at ground level. As these sequences purport to be the identical confrontation and arrest the difference in shadow direction can only be explained, extraordinary as it may seem, that one or other is actually on a different day! One or other must be fraudulent and staged in advance of the actual incident! As the view from above in Video A and from the ground in Video 3 concur and more accurately reflect the sun position time, this would appear to be the more likely candidate for the actual event on the day it was reported. "Sorry for all those replies that I didn’t get a chance to see as my Twitter is exploding. To be clear, not a single media has been willing to give the man who took this video a dime." It would appear that Vince is Chinese and interested in astro/physics and politics, but is not the actual guy who took the videos referred to. A question to him as to who it was, goes unanswered. Given earlier events in Europe where the filmer was a indicator of who knew in advance, this is a detail of some significance. CBC News · Posted: Apr 24, 2018 5:20 AM"
The next image is of the alleged route in a North South direction. Note shadows accord with the "Vance" images but not with the initial ones of the stand off confrontation. 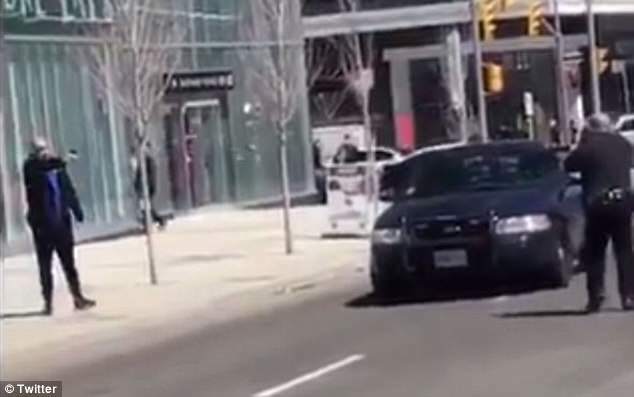 This video: https://www.thesun.co.uk/3ee6a5d4-ad70-41bf-9ee4-784c5edf5de0 published by the Sun Newspaper here: https://www.thesun.co.uk/news/6139256/toronto-van-attack-ken-lam-first-picture/ purports to be of the van running down people on its murderous route. Tucker: Would war against Assad make US safer?